(Duduk et roseaux en bois d'abricot arménien avec instruction de jeu et étui national. L’envoi inclus : 1) duduk pro fabriqué d’un abricotier. Le film de Ridley Scott "Gladiator" a en effet révélé au monde un duduk. « Blues Band » : Harmonica d'initiation facile. S'emmène partout avec vous, sonorité ronde et "blues". Cadeau sympa et idéal pour un débutant. Tonalité : Do (C). HarmonicaHohner neuf. These panpipes are made out of 20 tubes of bamboo of different lengths. Rondadores are traditionally played by indigenous people in the mountainous regions of Ecuador, Peru and Bolivia. Handmade and fairly traded in Ecuador. Tonalité : Do (C). Tonalité : Do (C). HarmonicaHohner neuf. le « Spécial 20 » réputé idéal pour bien débuter. KEY and Sizes for Zurna (Zorna). Material: Plum wood. Shruti Box professionale manufatto in legno TEAK. Prodotti nuovi ed originali. Niente Costi Nascosti. Assistenza gratuita prima e dopo la vendita. Composed by one professional musician and one craftsman. Mouthpiece Service. Chamber : Small. Table : Original (good condition). Guardala LT King Gold Plated. Composed by one professional musician and one craftsman. Mouthpiece Service. For Tenor Saxophone. Table : Original (good condition). Glenluce Bb Bombarde. Spainish Cocuswood with brass rings and a bell bottom. Traditional Breton style Bombarde. Excellent quality. Quality traditional Breton style bombarde. Classic hardwood tone. Top marks!". Shruti Box manufatto in legno KAIL (pino). La scala è da DO a DO (DO3 a DO4). Su ordinazione possiamo anche effettuare la scala dal SOL basso e dal SIb. Legno KAIL (pino). 13 note: DO DO# RE RE# MI FA FA# SOL SOL# LA LA# SI DO. Theo Wanne Gaia 2 - 7. Composed by one professional musician and one craftsman. Mouthpiece Service. Table : Original (good condition). Concert quality model manufactured by Manoj Kumar Sardar in Calcutta. This model has high quality set of reeds, which give a full and robust sound. It is suitable for artists and musicians who want a shruti box with an excellent sound. 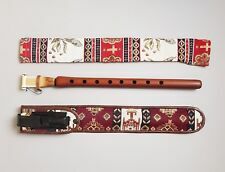 The flute has the split rib construction with drawn and rolled tone holes for a perfect pad seat, percision ground embouchure hole provides rich tone quality and intonation, Quality-Double bladder skin USA pads, and system used in schools. Available KEYS and Sizes for Kaba Zurna (Zorna). Technical Detail for Kaba Zurna. It has a very high sound. 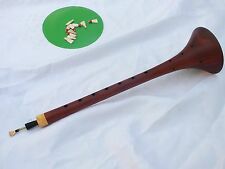 It is used in Turkish Folk Music. HOW TO TIE REED ON PIPE. Material: Plum wood. at kabazurna sol (G). AVORIO LUNGHEZZA CIRCA 70 CM. MANICOTTO DI AVORIO. FUNZIONANTE CON SUA CUSTODIA ORIGINALE VISSUTA. BUONA ASTA. Connetable New Swing 51 (Fluted chamber). Composed by one professional musician and one craftsman. •Chamber : Small (fluted). Original facing IV. •Tip opening : IV (original) / 68". Dukoff Miami Florida L7. The sound of the Link but with the dukoff touch ! Composed by one professional musician and one craftsman. Mouthpiece Service. Bite Plate : No Teeth Mark (See Photo). Composed by one professional musician and one craftsman. Mouthpiece Service. Berg Larsen 110-0-SMS Offset. Tip opening : 110 (original) / 102". This enables a single player to achieve a stronger, full-bodied sound not possible with a standard diatonic. Its curved body fits perfectly between your hands. 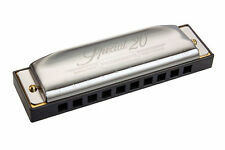 Octave harmonicas are similar to Tremolo models in reed layout and musical range. Theo Wanne NY Bros 7. Composed by one professional musician and one craftsman. Mouthpiece Service. Table : Original (good condition). Riffault SuperFini RM N4. Composed by one professional musician and one craftsman. •Tip opening : N4 (original) / 80". •Table : Original (good condition). Composed by one professional musician and one craftsman. Mouthpiece Service. •Tip opening : 115 (original) / 115". •Table : Original (good condition). 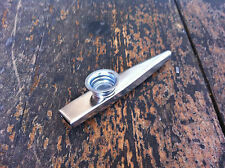 Beautiful and high quality - hand made 6 hole flute - professional quality. deep low tone - easy to play - close finger hole spacing. Hand made - - deep sound. great sound. hand rubbed finish. High Quality -. EVETTE BUFFET CRAMPON MASTER MODEL WOOD CLARINET, READY TO PLAY, SERIAL NUMBER D37864, CASE INCLUDED. Composed by one professional musician and one craftsman. Mouthpiece Service. Rare alto mouthpiece in Blue Hard rubber. Vandoren Blue A55 Java. Tip opening : A55 (original) / 96". Perfect condition (never played). 36 cm Abanoz Profi Sol # Zurna / 36 cm Ebenholz Zurna. Original Neck in perfect condition for Tenor Saxophone. For Yamaha saxophone : 480, 62, Custom EX/Z. Yamaha Neck E1 Solid Silver. Hallo, die Flöte ist in einem gut erhaltenen Zustand mit normalen Gebrauchsspuren. Composed by one professional musician and one craftsman. Mouthpiece Service. For Alto Saxophone. Table : Original (good condition). Composed by one professional musician and one craftsman. Mouthpiece Service. Rare alto mouthpiece in Hard rubber. Tip opening : B5 (original) / 59". Table : Original (good condition). Bite Plate : No Teeth Mark (See Photo). ZEN-ON Cherrywood Tenor, 1960 ’ s. Zen-On Cherrywood Tenor. ~ Cherrywood. Wonderful estate find! This high quality cherry recorder, with a balanced and flexible sound, is perfect for ensemble work. 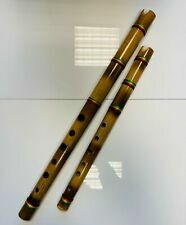 The Tenor features quality intonation and a fully resonant but serene tone throughout the whole range of the recorder. This is one of our new Demo models - 2019 "Elite" Models with German reeds and Plastic Valves ! 26 Treble Keys - 48 Bass (6 rows so you have the diminished. Our Demo Model which has been taken around a few UK Dealers to show them the new ELITE. ). Ce saxhorn alto en mi bémol est robuste, facile d'émission. Son timbre est doux et agréable. Ce saxhorn est visible à Saint Aignan (72) sur rendez-vous. Original Neck in perfect condition for Alto Saxophone. For Yamaha saxophone : 480, 62, Custom EX/Z. Yamaha Neck G1. G1 : Large Bore. Consider the machined Phosphor Bronze reed plates (replaceable) or the computer-aided laser cut, tuned and bendable reed system and the satin anodized, milled, billet aluminum alloy comb that holds it all together.